Zadar has recently paid much attention to refurbishing town public places. Such move has paid off multiple times as two town installations are considered to be the most attractive spots in Zadar. 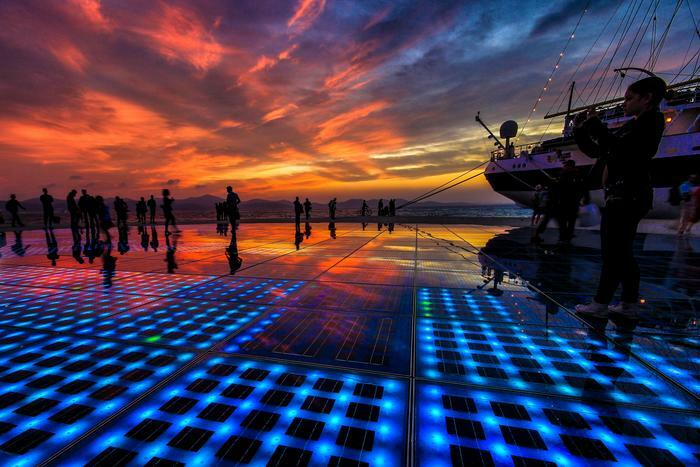 One of them is Greeting to the Sun, an installation that shows to passers-by magical play of light in the Zadar evening. Glass panels are arranged in a form of a circle, and underneath them solar cells are placed that absorb sunlight in order to light up Zadar at night. Greeting to the Sun is situated at the promenade and it was devised as an installation that connects Zadar to nature on a symbolical level. That is why the light effects and colour change correspond to the wave motion and sounds of nearby Sea Organ, another attraction of Zadar. Many visitors find it most interesting that they can walk over the Sun or sit on a glass panel while colours change beneath them, which is something that cannot be done almost nowhere else.